Get information about the tables in your database. 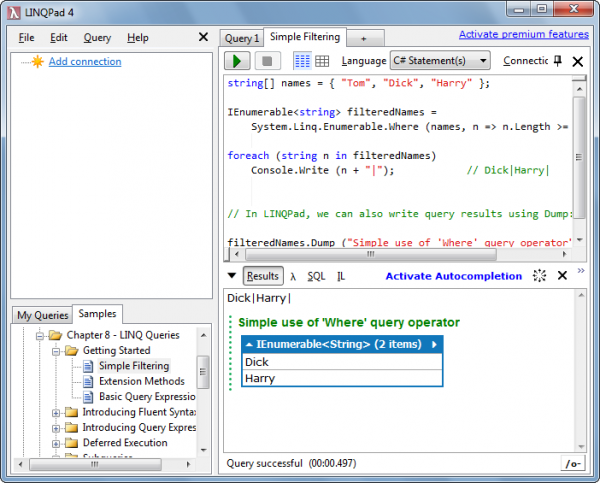 Do database queries with LINQ query syntax. See the result of the query nicely formatted in different ways. See the Lambda code created by the compiler from your query code. See the SQL code created from your query code. See the execution time of your LINQ query. Do database queries with Lambda syntax. If you forgot some keyword or some syntax, the “Samples” section is also good as a reference book for LINQ. Download and start LINQPad. No installation needed. At the top left, select “Add connection”. What do you think about LINQPad? Are there similar tools that I should know of?